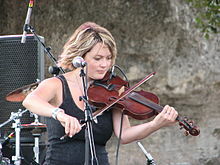 Sara Ullrika Watkins (born June 8, 1981) is an American singer-songwriter and fiddler. Watkins debuted in 1989 as fiddler and founding member of the progressive bluegrass group Nickel Creek along with her brother Sean and mandolinist Chris Thile. In addition to singing and fiddling, Watkins also plays the ukulele and the guitar, and also played percussion while touring with the Decemberists. With Nickel Creek, Watkins released five studio albums, one compilation album, and seven singles. During the band's seven-year hiatus, Watkins released three solo albums: Sara Watkins and Sun Midnight Sun on Nonesuch Records and Young in All the Wrong Ways on New West Records. In late 2005, Watkins stated in a PopMatters interview when discussing her first solo-written recorded song, "Anthony", that she "definitely [makes] the effort [to write more], but it's something that doesn't come too easy for me. Nor does it come really easy for the guys, I think they've just been doing it for a very long time." Watkins signed as a solo artist with Nonesuch Records in fall 2008 and released her self-titled debut solo album on April 7, 2009. Watkins started recording the album in February 2008, and it was jointly recorded in Nashville and Los Angeles. 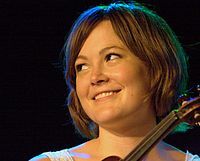 Sara Watkins was produced by bassist John Paul Jones of Led Zeppelin fame, who first performed with Watkins on a Mutual Admiration Society tour in 2004. Watkins toured the United States as an opening act in 2008. She performed short tours as an opening act for singer-songwriter Tift Merritt along the West Coast in March and April and with Robert Earl Keen around New England in September, as well as doing a 17-date tour with Donavon Frankenreiter in October. On April 14, 2009, she appeared on Late Night with Jimmy Fallon, with Jones on bass, Questlove of The Roots on drums, and her brother Sean Watkins on guitar. She has also performed on A Prairie Home Companion at the Minnesota State Fair and the Fitzgerald Theater and at the Alaska State Fair on August 28, 2011. In 2012, she toured with Jackson Browne as the opening act for his acoustic winter tour. In September 2011, Watkins indicated via Twitter that she would begin work on a second album in the fall of 2011. In May 2012, Watkins released her second solo album, Sun Midnight Sun, again on Nonesuch Records. Produced by former Simon Dawes guitarist Blake Mills, it features guest appearances from Fiona Apple and Jackson Browne. In 2016, Watkins won "Instrumentalist of the Year" at the Americana Music Honors & Awards. In 2002, Watkins starred in an advertisement for cell phone provider Cingular Wireless alongside her former fiddle teacher Dennis Caplinger, as well as other prominent bluegrass artists. In between 2000 and 2004, Watkins and the other members of Nickel Creek (Chris Thile and Sean Watkins), John Paul Jones, and Pete Thomas collaborated on an EP, Mutual Admiration Society Solo Sampler; an album, Mutual Admiration Society (recorded in 2000); and a brief tour. The 2007 documentary film Arctic Tale featured a song by Watkins and musician Grant-Lee Phillips, titled "Song of the North (Beneath the Sun)". Watkins lent her vocal talents to be used in the film alongside other performers such as Aimee Mann and Brian Wilson. In January 2008, Billboard reported a new supergroup octet tentatively named The Scrolls, later named Works Progress Administration (W.P.A.). The octet is composed of Watkins, her brother Sean Watkins (guitar), Glen Phillips (guitar, vocals), Benmont Tench (piano), Luke Bulla (fiddle), Greg Leisz (various), Pete Thomas (drums), and Davey Faragher (bass). The group released their album WPA in September 2009. Watkins is featured on Needtobreathe's 2009 CD The Outsiders on the track "Stones Under Rushing Water". In late January and early February 2010, Watkins undertook a short tour with Jerry Douglas and Aly Bain in Scotland and England under the "Transatlantic Sessions" banner, culminating in a performance in the Royal Festival Hall in London on February 6, 2010. In June 2010, Watkins appeared on the Nerdist podcast as a musical guest, performing her best-known solo song, "Long Hot Summer Days" (a John Hartford cover). Later that summer, she participated in the Summer Love Tour with Garrison Keillor in venues across the United States. She guest hosted Keillor's show, A Prairie Home Companion, on January 15, 2011. Watkins contributed fiddle, guitar, percussion, and vocals on The Decemberists' 2011 tour. Also in 2011, she (and her brother Sean) began to perform as a musician and singer in the humor/retro-radio podcast "Thrilling Adventure Hour". Watkins played violin and sang on "A Face To Call Home" on John Mayer's 2012 album Born and Raised. During 2012 and 2013, she toured with Jackson Browne, both as an opening act and accompanying him during the performance. Watkins and her brother Sean play regularly at the Largo nightclub in Los Angeles as "The Watkins Family Hour". Keyboardist Benmont Tench (of Tom Petty and the Heartbreakers) and bassist Sebastian Steinberg (formerly of Soul Coughing) are regular participants, and other guest musicians from the Largo family generally show up as well, including Jon Brion, Fiona Apple, Don Heffington, Greg Leisz, and former Nickel Creek bandmate Chris Thile when he is in town. The irregular collaborations led to a 2015 album and tour under the same name. Also in 2015, Watkins toured extensively with Sarah Jarosz and Aoife O'Donovan (of Crooked Still fame). The trio, who now play under the name I'm With Her, hosted the radio show A Prairie Home Companion on October 10, 2015. Watkins also performed vocals for "June & Johnny" on Jon Foreman's 2015 EP The Wonderlands: Darkness. On August 16, 2008, Watkins married her boyfriend Todd Cooper, in her parents' backyard in Vista, California. On June 15, 2017, she announced via Twitter that she and her husband were expecting a child in September. "Young In All The Wrong Ways"
2015: "Crossing Muddy Waters" / "Be My Husband"
2017: "Send My Love (to Your New Lover) - [Live - Feat. Paul Kowert]"
^ "Watkins, Sara Ullrika". ASCAP.com. Retrieved 2007-02-24. ^ Watkins, Sara. "getting ready... ". MySpace. January 21, 2007. Retrieved November 26, 2007. ^ a b "Nonesuch Signs Sara Watkins". Nonesuch Records. November 25, 2008. Retrieved November 29, 2008. ^ Tranter, Nikki. "Understanding and Ability". PopMatters. November 18, 2005. Retrieved March 27, 2008. ^ a b c Dickens, Tad. "End of the road for Nickel Creek?". The Roanoke Times. November 2, 2007. Retrieved March 1, 2008. ^ "Nickel Creek members' tours stop in NC". Triangle Music. January 24, 2008. Retrieved March 1, 2008. ^ a b "Sept – Northampton, MA" Archived 2011-07-16 at the Wayback Machine. Sarawatkins.com. September 2008. Retrieved September 16, 2008. ^ Hubbard, Rob. "'Prairie Home Companion' hits its stride at Fair". TwinCities.com. Retrieved 2015-05-06. ^ "A Prairie Home Companion for October 23, 2010 | American Public Media". Origin-prairiehome.publicradio.org. Retrieved 2015-05-06. ^ a b "Sun Midnight Sun". Nonesuch Records. Retrieved 5 June 2013. ^ "A Most Cingular Sensation". Wright For You. June 2002. Retrieved June 21, 2008. ^ "Brad Davis, Tim May & John Moore" Archived 2009-04-12 at the Wayback Machine. ^ "Arctic Tale [Original Soundtrack]: Credits". MSN. Retrieved April 22, 2008. ^ Finke, Nikki (2010-04-14). "Garrison Keillor's Prairie Home Companion Skeds "Summer Love" 25-City Tour". Deadline.com. Retrieved 2015-05-06. ^ "January 15: Nickel Creek alum Sara Watkins; clawhammer banjo player Abigail Washburn; singer-songwriter Tom Brosseau". Prairiehome.publicradio.org. 2011-01-31. Retrieved 2015-05-06. ^ "News 1.4.10". Thedecemberists.com. Retrieved 2015-05-06. ^ McCue, Lori (3 September 2015). "Sean and Sara Watkins are taking their Watkins Family Hour on the road, and bringing famous friends". Washington Post. Retrieved 14 July 2016. ^ Sara Watkins [@SaraWatkins] (21 August 2015). "I sang with @jonforeman on his song June and Johnny - out today on @Spotify!! Link below. Thanks Jon! Check it out!" (Tweet) – via Twitter. ^ John, Emma (18 February 2018). "I'm With Her: 'We're about camaraderie, not Hillary'". the Guardian. ^ "Summer Is Almost Over..." Archived 2009-04-12 at the Wayback Machine. Glenphillips.com. August 24, 2008. Retrieved August 30, 2008. ^ Sara Watkins [@SaraWatkins] (15 June 2017). "Well, it's about time to fess up and tell you all that in September, my husband and I are…" (Tweet) – via Twitter. ^ "Sara Watkins Album & Song Chart History – Billboard 200". Billboard. Nielsen Business Media, Inc. Retrieved July 12, 2016. ^ "Sara Watkins Album & Song Chart History – Folk Albums". Billboard. Nielsen Business Media, Inc. Retrieved May 17, 2012. ^ "Sara Watkins Album & Song Chart History – Heatseekers Albums". Billboard. Nielsen Business Media, Inc. Retrieved May 17, 2012. ^ "CMT : Videos : Sara Watkins : When It Pleases You". Country Music Television. Retrieved September 11, 2012. ^ "CMT : Videos : Sara Watkins : You and Me". Country Music Television. Retrieved April 16, 2013. ^ "CMT : Videos : Sara Watkins : Move Me". Country Music Television. Retrieved October 14, 2016.